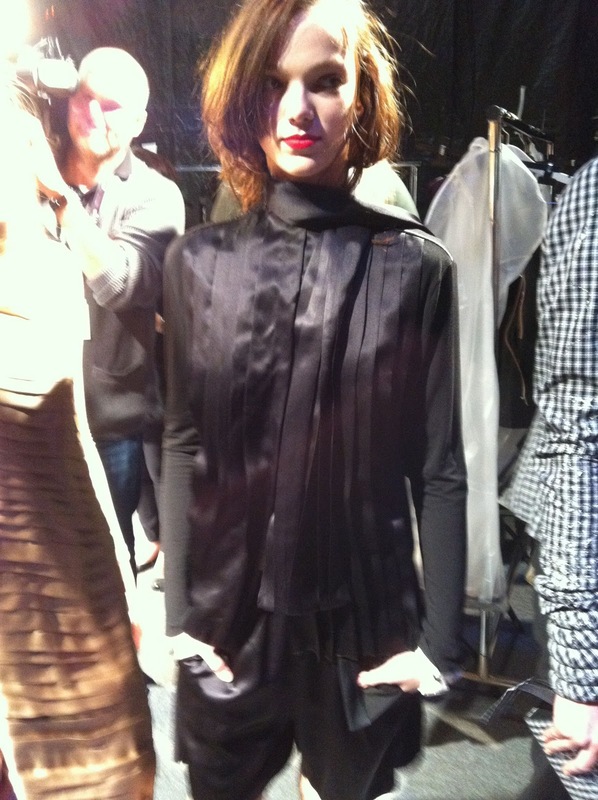 When Montreal designer Denis Gagnon marched into the backstage dressing area in a storm of "câlice" and "tabarnac", I felt right at home. Wearing his signature oversized black glasses, he pushed rolling racks and curtains out of the way in a fit of Montreal-style impatience and stress ( think Quebec drivers if you don't get what I mean) all the while scaring the living shiz out of the timid Toronto volunteers. His collection this season showed a lot of edgy pieces, but that comes as no surprise, the man's job is to prove his edginess. The collection, entitled Denis in the Garden!, is his take on spring time cuteness and garden parties. Much like his collection last years, Gagnon played with the idea of a man's suit. The pieces were all very masculine - black and white tux pieces, black mesh shirts with white tux-fronts and cuffs, tailored blazers and trousers - but with a feminine flare. Another idea he worked off of, other then the "tux", was the floral suit. 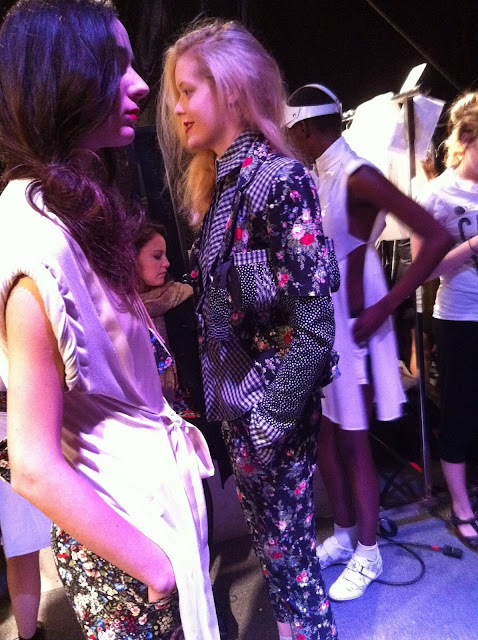 He used a great floral pattern on black fabric for several jacket and pant suits in the collection. The pattern went really well with his "in the garden" theme and gave the audience something new to think about for spring and summer. 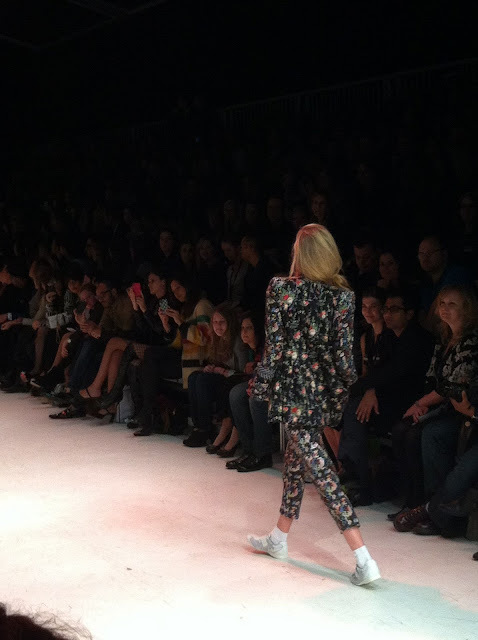 He was the only one, if I'm not mistaken, to show wallpaper patterns during Toronto Fashion week for next year. The floral trend was huge in New York and Paris, with designers like Miu Miu and Givenchy sending out models in what looked like their gramma's chopped up curtains. Anyway I love the patterned suit, the mesh man-tux shirt, and the great little white and black oxford shoes. I didn't love, however, the 20 minute artsy and superbly lame intro video. How Montreal do you have to be to start your runway show with a ridiculous video of models running around a forest in slow-motion? Not only was the video never-ending, Gagnon made sure his freaking glasses had at least 10 minutes of screen time... not impressed.